atouvap.fr • Consulter le sujet - LES BONS PLANS de HEAVENGIFTS en FEVRIER ! 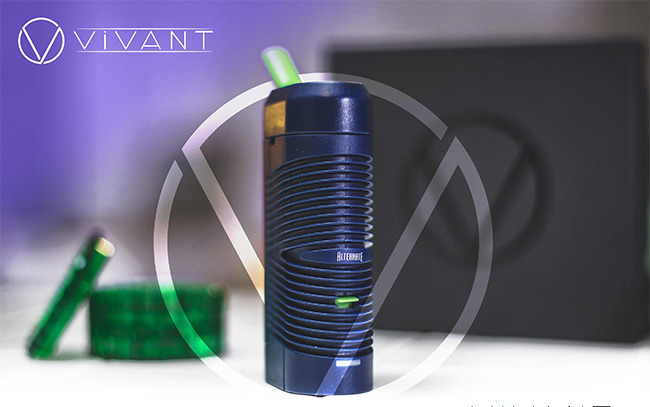 As we progress towards an open-minded view of healthy living, offcially introduce our first Dry Herb Vaporizer,Vivant Alternate. The Alternate is a loose-leaf vaporizer meant for everyday use.Its convection heating system uses hot air to produce vapors from flower products. This reduces harsh byproducts associated with traditional conduction vaporization. As some of you may know that, different herbs call for varying degrees of heat. Alternate allows users to choose what heat they want to vaporize their herbs at down to an exact Celsius or Fahrenheit, also allows users to customize their experience.Nowadays it is quite commom to see air flow control system on most e-cigarette, but it is rare to see it on a dry herb vaporizer.Well, Alternate allows you to cool the vapor and find the best mix of air for your hits by such function.And its full convection hot air system enable a clean,pure vapor.If you have not heard about any dry herb vaporizer, the Vivant Alternate might be the one for you to open the gate. Use our coupon code "AHG10" to get an extra 10% off discount. Imagine the moment that you are blowing crazy vapor clouds alone at home in cold winter, your mom/girlfriend suddenly comes back and shout at you for this vapor-filled house, bad experience, huh? Now the situation can be changed with an interesting gadget, Avatar VapeNut e-Cig Vapor Eliminator. Just as the name implies, it's specially designed for vapor filtration and elimination. Aesthetically, the Avatar VapeNut features a rounded and elegant body design. Functionally, it has a built-in smoke sensor that can detect vapor density in real time and utilizes air turbocharger system to filter high density vapor, forming clean and healthy air. It also comes with four modes that vary the speed and rate of filtration according to the vapor density. High quality quiet fan and circular duct design avoid buzz noise. In addition, the VapeNut also includes a car adapter that allows you to power it and relievedly enjoy vaping in their vehicle without keeping windows close. Simply put, this device is an intelligent and useful system for all regular vapors. Now you can preorder the Avatar VapeNut at US$74.6 with our 10% off coupon code "AHG10". Introduce you a new compact and luxurious kit from Aspire, called Zelos 50W kit with Nautilus 2, which is a nice combo of a 50W Zelos box mod and Nautilus 2 tank. Zelos is powered by a 2500mAh Li-Po battery. From the point of function, as a variable voltage and wattage device, it has a maximum output of 50W, supporting VW/VV/Bypass/TC-Ti/TC-Ni/TC-SS modes, meeting your different vaping needs. Coming with precise TC settings, the new firmware ensures its wattage can also be adjusted under TC mode. From the perspective of appearance, it’s definitely an ergonomic box mod due to the sleek user-friendly design. Plus stylish modern colors-black, red, grey must make you stand out in the crowd. As an upgraded version of original Nautilus, Nautilus 2 is a mouth to lung tank with TPD compliant 2ml e-liquid capacity, which looks very curvy. 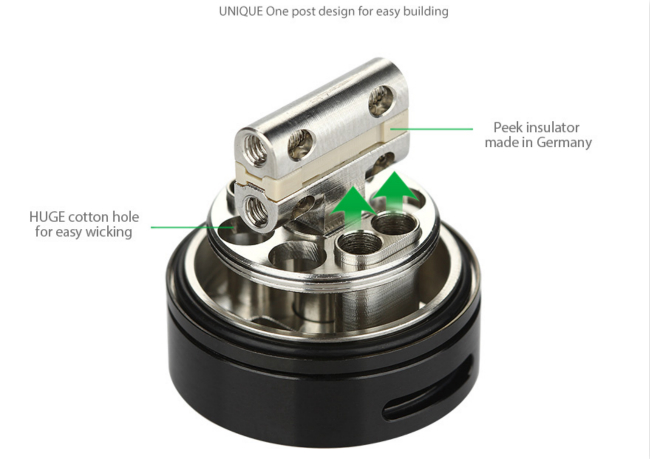 It comes with a pre-installed 1.8ohm BVC coil, as well as bottom airflow adjuster. Top-fill design make it so easy and keeps things clean. The interchangeable coils with other Nautilus coils allows you to personalize your vaping experience. If you are looking for a new kit, this one must be a smart choice. Don’t forget to use our coupon code "AHG10" to get an extra 10% off discount. Speaking of the Troll from Wotofo, you would definitely think of its widely popular RDA series. Their excellent performance impressed many drippers. But now, after hearing the voice of many none-drippers, Wotofo extend the Troll series into RTA territory. Amazing, it's a tank now, which means larger e-liquid capacity. The question is will this new tank maintain a good momentum like its predecessors? Well, in view of Wotofo's previous achievements and innovation on this one, we have a positive thought. Now let’s take a look at this new tank. The Troll RTA by Wotofo has a large 5ml e-juice capacity, enough for most vapers' daily use. And the gigantic top juice holes make it way easy to refill. The deck design is pretty unique. 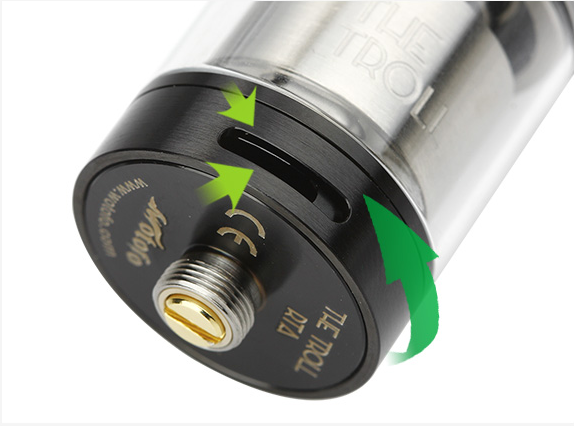 Unlike the common velocity style, the Troll RTA features a one-pose deck. Building it feels pretty much like a velocity-style deck, but the positive and negative posts are horizontally stacked on top of one another. The post holes and cotton holes are quite huge and enough for fancy coil builds and easy wicking. German-made peek insulator is a plus for electricity safety. The deck is placed in the middle of the tank, which is quite similar to the DigiFlavor Fuji. This structure ensures fast wicking and shorter air travel between the chimney and the build deck. And the short stature of this tank results in a fast vapor delivery from chamber to drip tip. The airflow control is easy to use. Airflow enters from 2 large airslots on the bottom of the base, travelling into 2 centered internal airholes located on each side of the deck, which forms a direct-to-coil airflow system, offering you smooth and concentrated flavor. Lastly, it's 24mm in diameter, which makes it highly adapted to most mods. Plus the fine machining quality and nice looking, it will be another good choice for both cloud and flavor chasing. If you are interested in this tank, please don’t hesitate to preorder it with our 10% off code “AHG10”. The Eleaf iStick Pico made a hit for its compact size and impressive performance in 2016. Now Eleaf bring back this series with a Resin edition, which is sure to be a breathe of fresh air in the vaping community with its bold new look and comfortable texture. As the name implies, this new Pico version adopts a lightweight and durable resin encasement which comes in a variety of unique psychedelic patterns and colors. In other words, each iStick Pico Resin is the one and only. As for functionality, it inherits all great features of its predecessor. Powered by a single interchangeable 18650 battery, can fire up to a max output of 75w, making it a fairly powerful mod in the mid-wattage ranges and suitable for a wide vaping audience. In the full kit package, Eleaf also pair it with the Melo 3 Mini tank, which comes with a small 2ml e-juice capacity, using two pre-made coil heads with resistances of 0.3ohm and 0.5ohm respectively. This new combo will bring you an amazing vaping experience just like the original one, but add more personality. Now you can preorder Eleaf iStick Pico Resin kit at US$66.6 with our 10% off coupon code "AHG10". Eleaf's iCare & iCare mini got much attention for their simplicity & efficiency to new vapers last year. Now Eleaf have extended this series with 4 newly released starter kits, namely iCare 110, 140, 160 and Solo. They all feature an anti-leak internal tank with top fill solution and simple-to-use one button operation design. iCare 110, 140, 160 comes with same stick-like body shape but vary in diameter and height. iCare 110 is the slimmist one, with 1.3ml tank capacity & 320mAh battery capacity; iCare 140 is a little bit bigger, with 2ml juice reservior and 650mAh battery capacity; iCare 160 is the biggest one, with 3.5ml e-liquid capacity & 1500mAh battery capacity. In addition, iCare 140 features a spiral mouthpiece design for a more flavorful vortex of vapor; iCare 160 is able to light up with 7 colors. As for iCare Solo, it looks more like a slender version of original iCare. It can hold 1.1ml of e-liquid and support 320mAh battery capacity. It also comes with a intuitive 3 color LEDs to show the battery capacity clearly. All in all, these 4 new kits are pretty easy to use and work good with the popular IC coil heads, perfect for MTL vapers. Use our 10% off code "AHG10" to pre order iCare 110 at US$11.7, iCare 140 at US$12.6, iCare 160 at US$17, and iCare Solo at US$12.6. Geekvape really did a great work in RTA/RDTA territory since stepping into e-cigar market, which is not hard to see from the heated response of the vaping community to the previous Griffin, Avocado and Tsunami series. But Geekvape don't stop there and bring us a new innovative RDTA, called as Medusa. It features a short profile, with a 25mm diameter and 3ml e-liquid capacity, making it a good choice for those drippers who love compact atty but still wanna a decent tank capacity. And dripping or refilling this Medusa RDTA is easier than ever, with two optional ways available; One is by taking off the top cap and then drip your e-juice, the other is by screwing off the top cap and chamber for direct dripping. Building it is also with no hassle tanks to the large deck and post holes. Adjustable side airflow makes the air travel to drip tip being shortened, which will deliver the perfect flavor. Plus the elegant exterior design and high quality materials, this Medusa RDTA is sure to be Geekvape's next hit product. Please feel free to use our 10% off code "AHG10" to pre order this Medusa RDTA, only US$23.39 for black version, US$22.49 for SS. Good news for sub tank fans! IJOY just released a new sub tank, called ELF, is curvy, compact and elegant MTL tank. 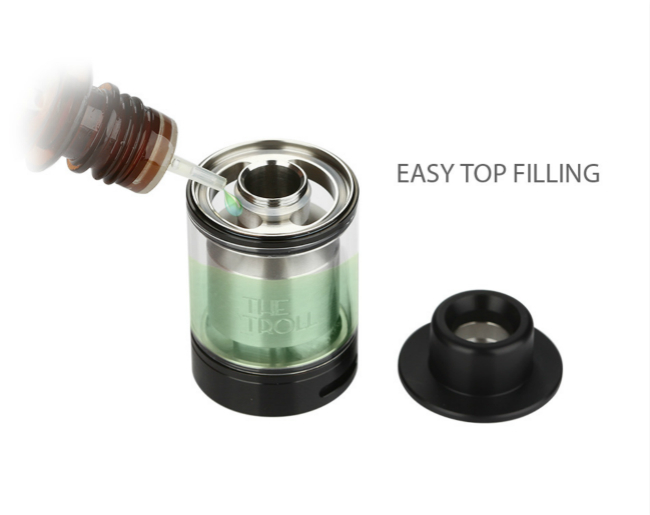 With the e-liquid of 2ml TPD compliant, it can easily filled through the top. It comes with a pre-installed 0.7 vertical coil and a spare 0.5 coil. The highlight is that the coil features coil and chimney 2 in 1 design, which largely reduces the airflow travel. Due to this unique coil design, ELF makes you fully enjoy the best out of your favorite e-liquid, providing you the best flavor experience. Moreover, the unique resin drip tip make a plus for it. 4 colors in available, white, black, gold and teal. In a word, this true flavor MTL tank is worth a try.